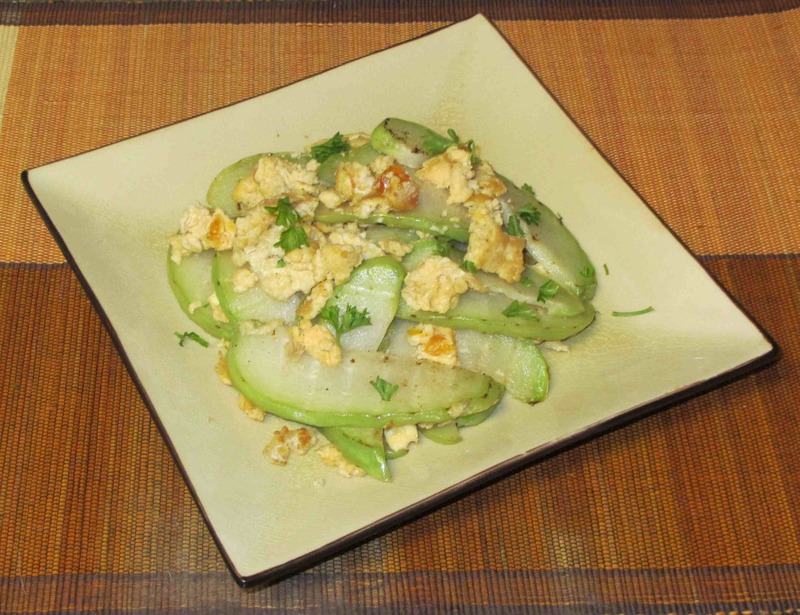 Slice the Chayote into strips. Toss them in a bowl with the salt and leave to sit for twenty minutes or so. Break the Salted Duck Eggs into a bowl and then break up the solid parts of the yolk with a knife into tiny chunks. 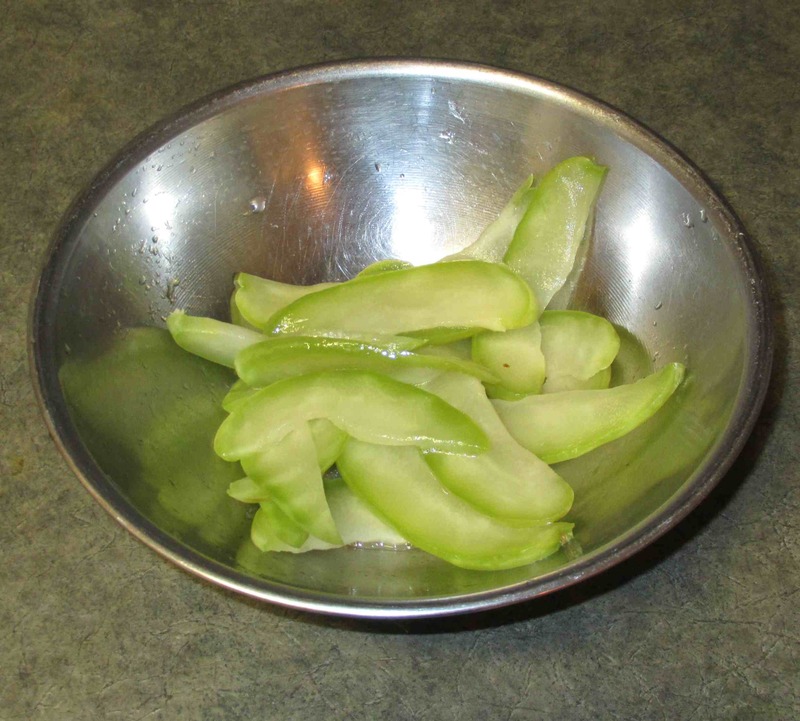 When the Chayote slices have wilted somewhat, rinse them well and squeeze out the excess water and put back in the bowl. 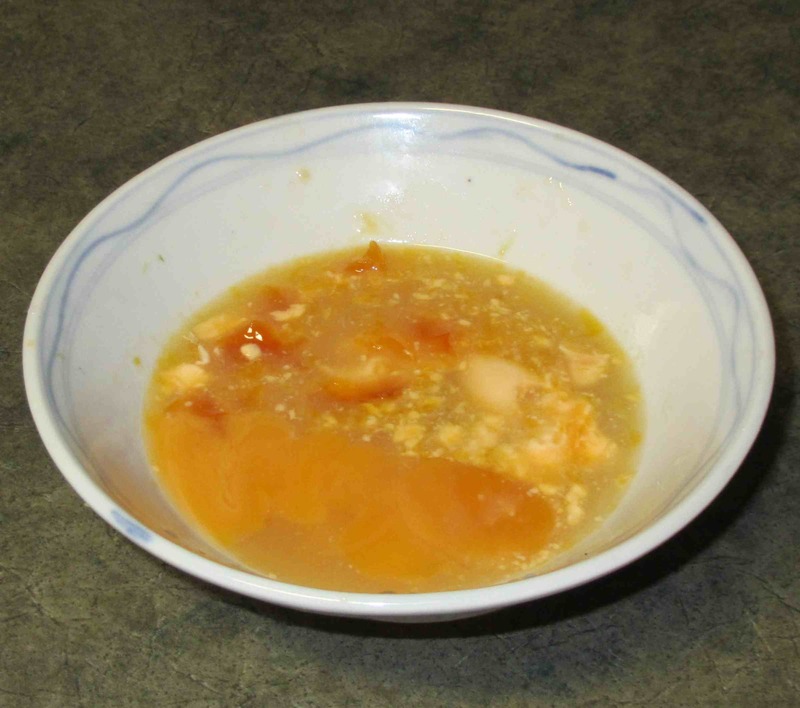 Mix together the sugar, lemon juice, sherry and sesame oil and stir to dissolve the sugar. Pour this over the chayote and leave to marinate for at least fifteen minutes. 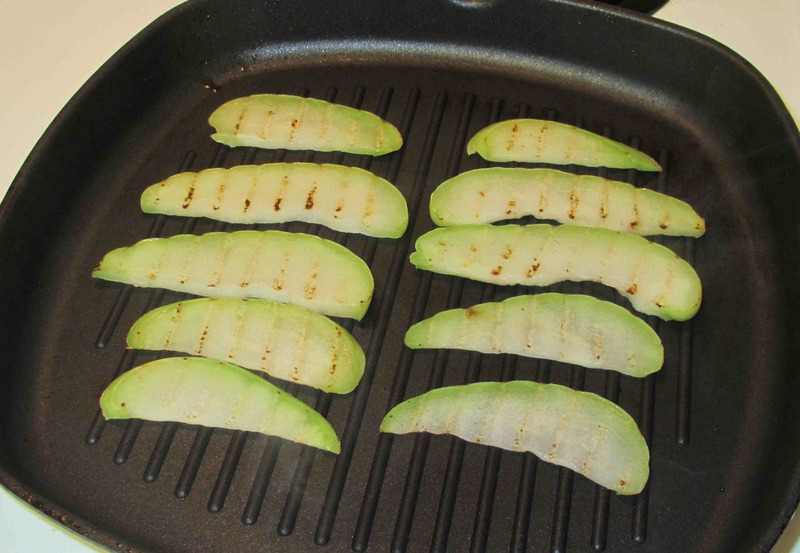 Lightly grill the chayote until cooked and some nice light grill marks appear. Do not overdo this part. You want the marks to be faint… not heavily dark. Heat your wok over medium flame and add a tablespoon of oil. 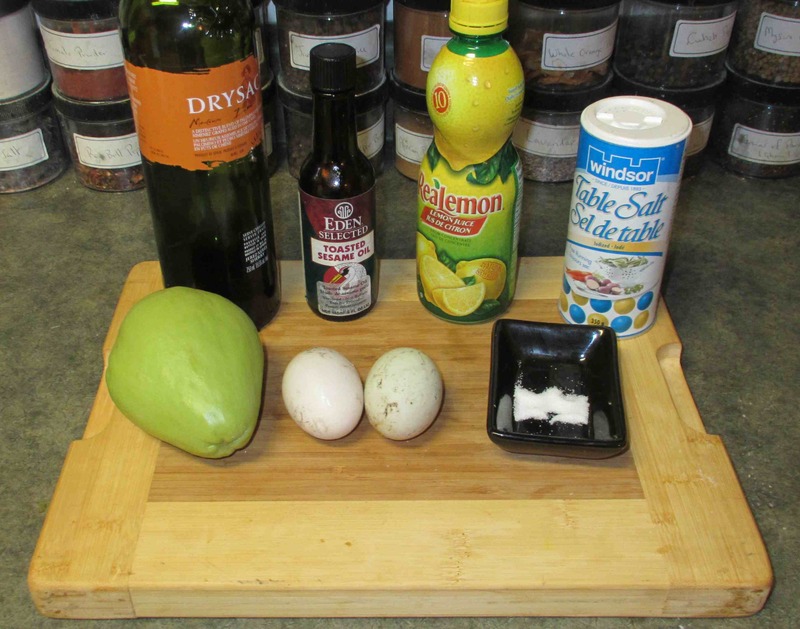 When the oil is hot, pour in the egg and, just as the white is beginning to set, break it up into chunks with the edge of your spoon. 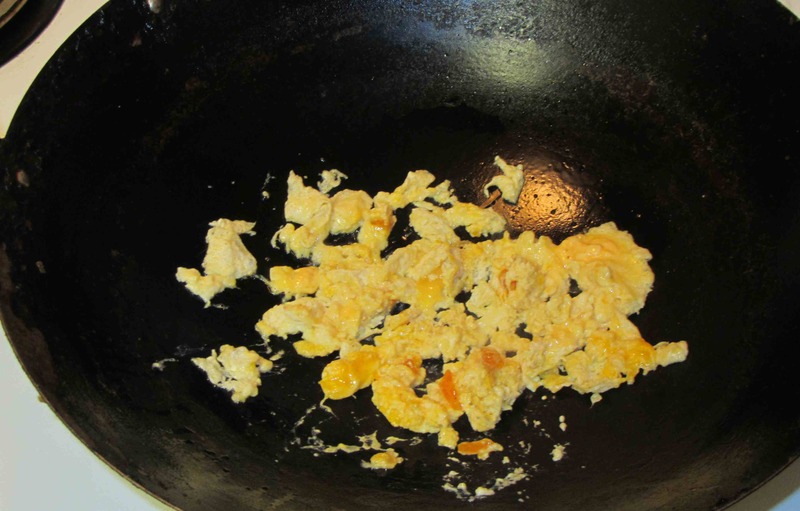 You don’t want to scramble the eggs entirely; rather you should end up with distinct pieces. 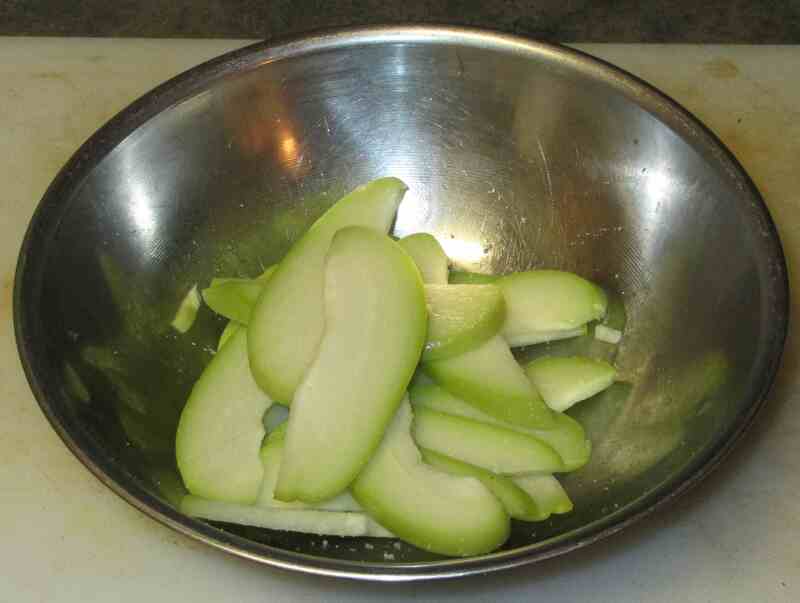 Finally, add the chayote slices, sauté briefly until they are heated through then plate and serve. First, I had a bit of disappointment with the final appearance of this dish. One of the duck eggs had a very liquid yolk rather than being a solid bright gold and it leached its color into the whites. I had hoped to have a nice contrast with the gold and a pure white but that, unfortunately, did not happen. Still, the taste of this was amazing. 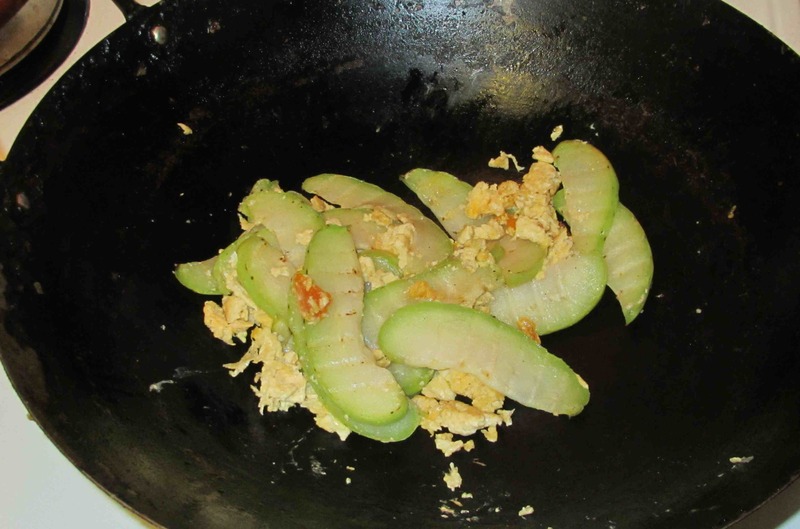 It was salty, of course, but the umami quality of the eggs gave a lovely fillip to the mild, earthy freshness of the chayote. The chayote was still just a little crisp and the overall texture was excellent. I was really, really please with the result and I will definitely be adding this to my repertoire. If you can lay your hands on some salted eggs, please give this a try! Looks good. I love choko. MMMMMM,..;a must try recipe! Looks tempting too! Indeed… *BUT* as I won’t be cooking tonight I *may* just return for a few final single malts before I return home! Interesting idea! I am going to see if I can find some salted duck eggs and try this. My family usually boil the salted duck eggs and have it with congee, so I’ve never had it cooked another way. I have still yet to try congee…. I want to try it in a restaurant before cooking it myself tho. Maybe on my next trip south! Holy cow! You get the award for brave flavour combinations. And I think it’s important not to discount dishes that aren’t particularly visually appealing. In the food blogger world we get so obsessed with a pretty picture and I worry sometimes that that consideration is trumping too many things for me when I’m developing recipes. It’s really important to remember that some of the best things in life, not just in food don’t always look all that camera-ready. Sounds like it a was a delicious little meal! Interesting… I never been too keen of chayote, but your recipe makes it look very appealing 😉 I’ll have to give it a try. It’s been over a decade since I’ve had salted duck egg. Sure I’ve lived in cities where it’s not hard to get but haven’t been motivated to buy them. It’s nice to have a bit of salted egg inside a sticky rice packet steamed and wrapped in bamboo lead along with other chopped food and stuffed into the rice packet. Yum! Sorry, “bamboo leaf” not bamboo lead! I’d like to find bamboo leaf… I’ve eaten rice that way in restauants and I’d love to cook with them. Of course Chinatown offers them. I would soak the leaves before using them. There is a technique (which I don’t know) of tying up the packets with cotton string tightly so that the packets don’t leak rice, etc. into boiling, then simmering water. The rice is cooked in advance. One could be super creative by trying with clean, wet corn husks…like tamales!